By now, it’s the 8th of January and my time in Hong Kong is starting to draw to an end. My ankle was still playing up at the time, so it was mostly a case of being in a wheelchair just to keep it from flaring up. The weather was good, and so it was decided to have another outing. 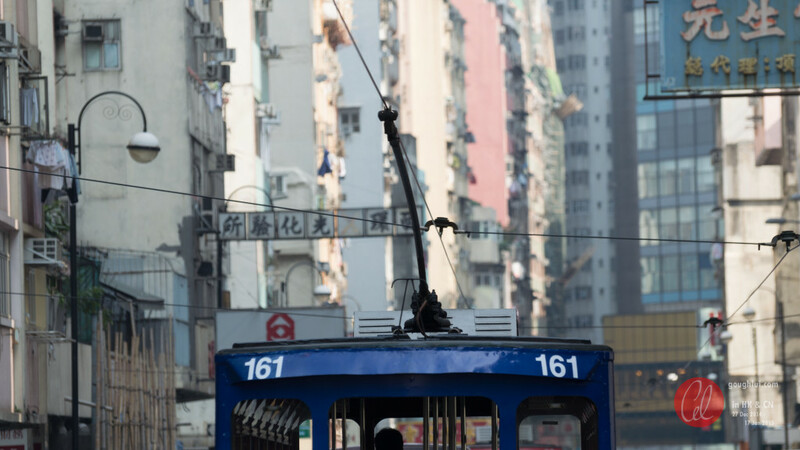 Having been to Hong Kong before, I had ridden the MTR numerous times, but never have I actually ridden the ‘ding ding’ tram, which itself is a tourist attraction. Thus, it was decided – I was going to have a tram day. 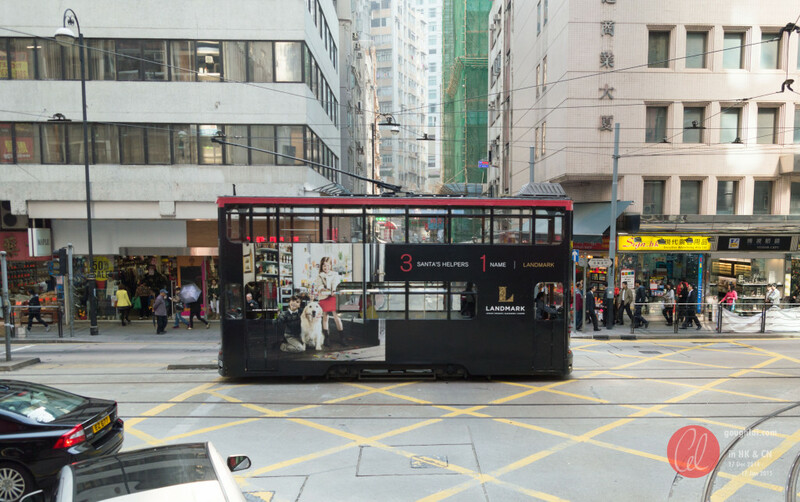 The trams in Hong Kong are an interesting mix – they form an integral part of the public transportation network, while remaining a tourist attraction of sorts with its heritage appeal. The network itself is over 100 years old, with 120 stops over six “lines” and 30km of track. The interactive map, reproduced in a Google Maps screenshot, shows the layout of the route. 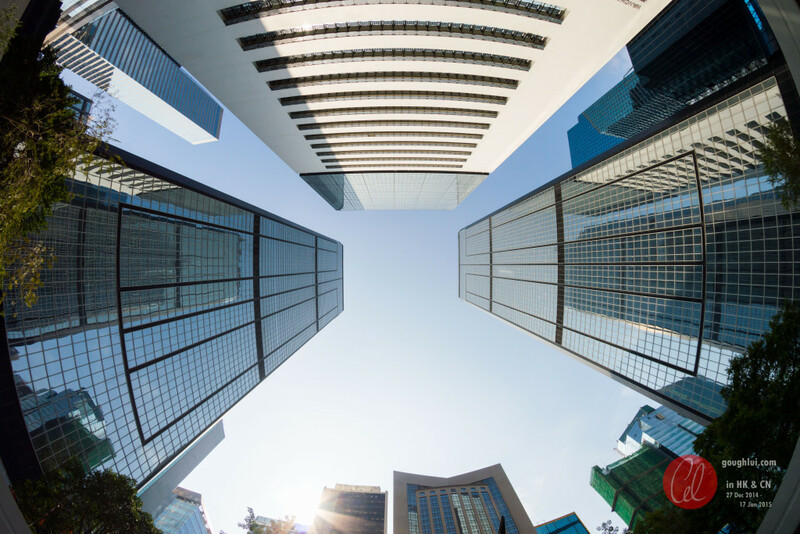 From here, it is not clear how the “lines” operate – in fact, they are not distinct lines, but just different subsets of the main line served at different frequencies. This is made clear by the eastbound and westbound PDF maps, which show the lines in-between the stations. 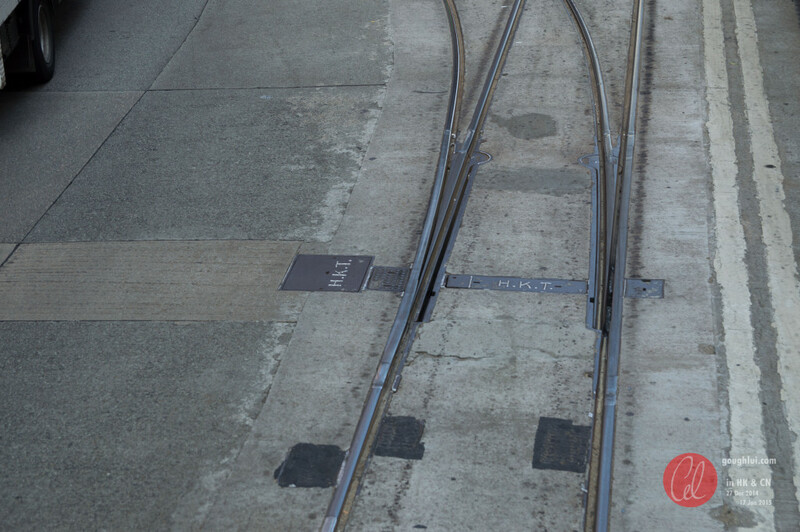 The trams generally stop at every stop along their route, and run at least twice an hour – stops with more “lines” passing would see more frequent service. 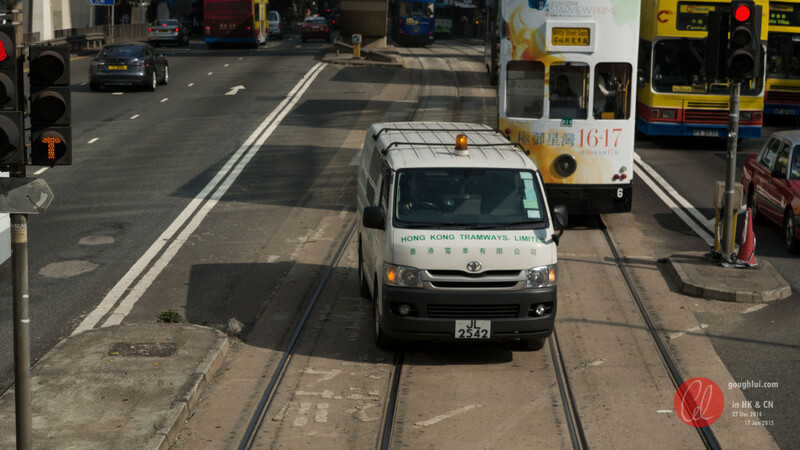 The trams are run at a “flat fare” regardless of the length of the trip of HKD$2.30, which is AU$0.39 at today’s rate – a bargain especially if you intend to ride the tram end to end (or close to it). 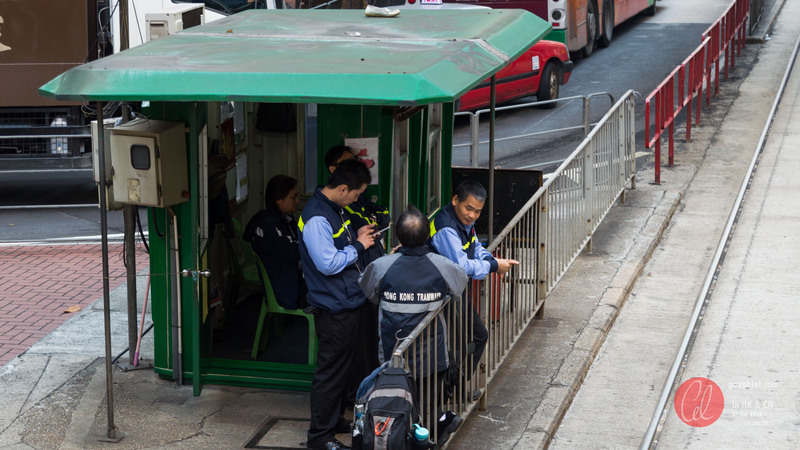 The tram is boarded from the rear, with payment made upon leaving the tram at the front, and Octopus card is accepted. Generally, trams are wheelchair accessible, but with difficulty and the help of a carer. The steps to the upper deck are narrow, and several different “generations” of tram unit are in service. Having done the research online, we were well armed to begin our tram day. 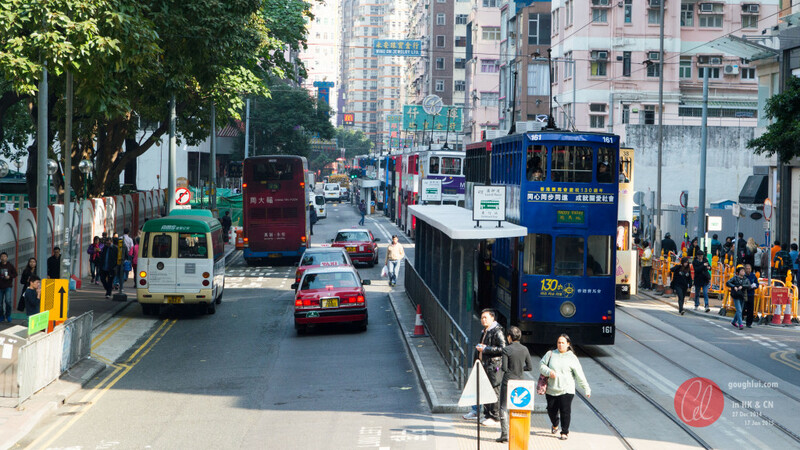 Our tram day started at Wan Chai, where we started with a tram that headed towards the Happy Valley terminus. Unfortunately, because of time constraints and desire to visit certain locations, we didn’t actually ride the lines from end to end. Because I was still not entirely awake, I spent the ride from Wan Chai to Happy Valley just looking out the window, observing and absorbing the feeling of the tram car. It’s rather unique, as the trams are relatively small double deck “sardine cans” and the inside is always rather packed. We were lucky to get on an older style tram with front windows that can be opened, and with some patience, we could shuffle into a seat at the front for the best vantage point. The trams were heavily patronized, and initially, we were not able to get a seat at all. 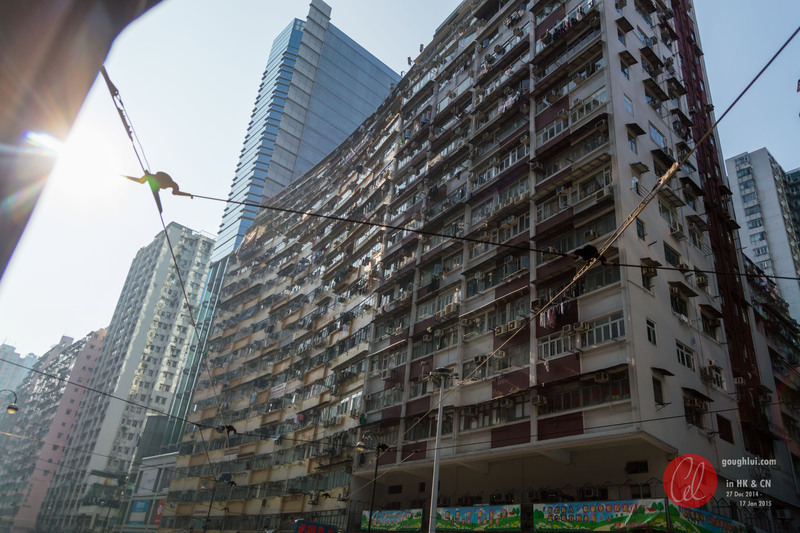 Having “woken up” by the time we got to the Happy Valley terminus, I got out the camera and decided to aim for a timelapse. 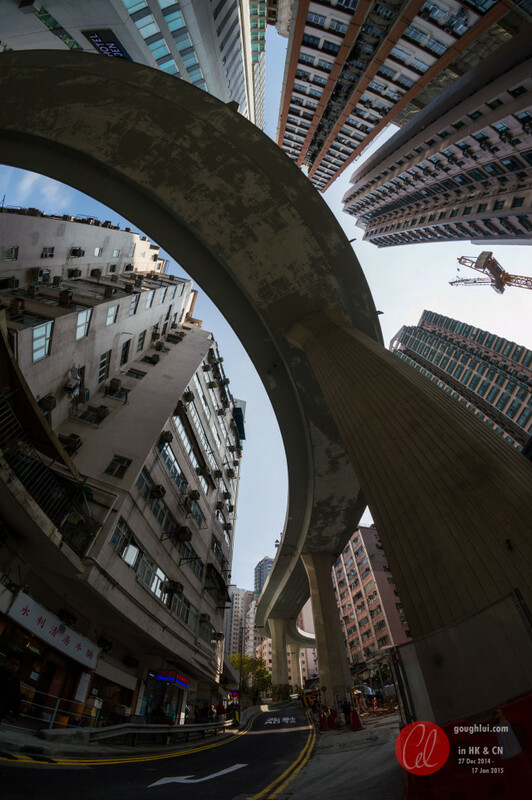 I had the intervalometer going, although it didn’t seem to click fast enough for my liking, and used the 8mm Samyang manual fisheye lens, looking out the front window. There was no space inside for a tripod, so I went hand-held for an added “shakiness”. While it’s probably not the best result, and because of the start-stop and lens distortion nature of the shots, not amenable to software “correction”, it’s still fairly artistic. The tram ride was about 45 minutes of arm-cramping “holding” the camera and aiming it as steadily as possible despite the juddery start and stop of the tram. About 1000 shots were taken all-up, assembled into a 4k-resolution 12-fps video clip. I suggest you watch this at full-screen for the best effect, and please choose 1440p or 2160p even if watching at 1080p if your connection can handle it as the 1080p compression really smears everything. Sorry for the abrupt end – it was assembled from Lightroom processed 100% JPEGs using ffmpeg command line only. 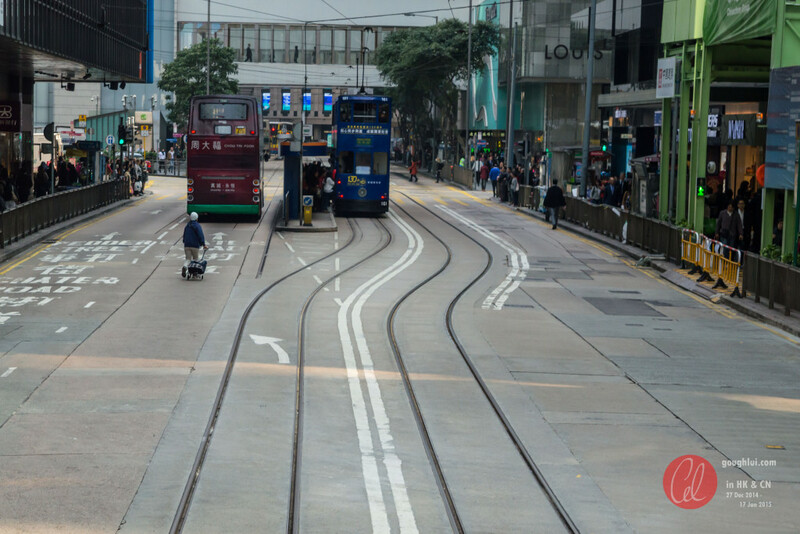 The time lapse shows just how much “waiting” the tram does for other traffic which shares the tram lane – some of which is not legal (e.g. the bicycle). 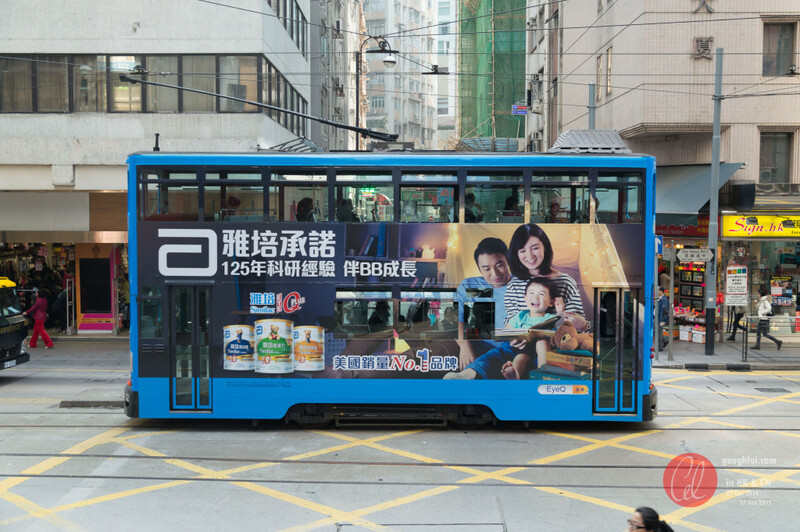 We get to see trams going the other way as well, with their clearly identifiable numbers and advertising liveries which adorn the whole tram, including the side and billboards at island style tram stations. In the time lapse, we can see the ride from Happy Valley Terminus to near Whitty Street. 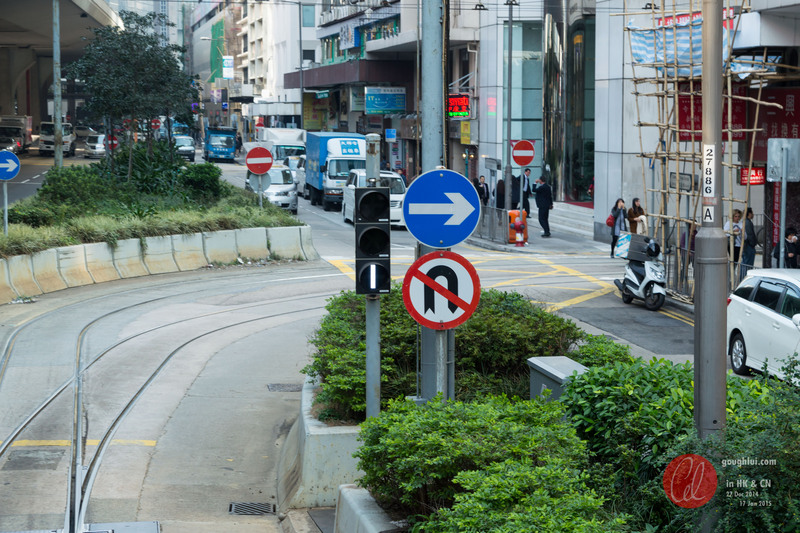 It was at this time we got off to stretch our legs and have a “nature stop”, which was a little more complicated than expected, requiring the aid of MTR attendants to let us into their behind barrier facilities. 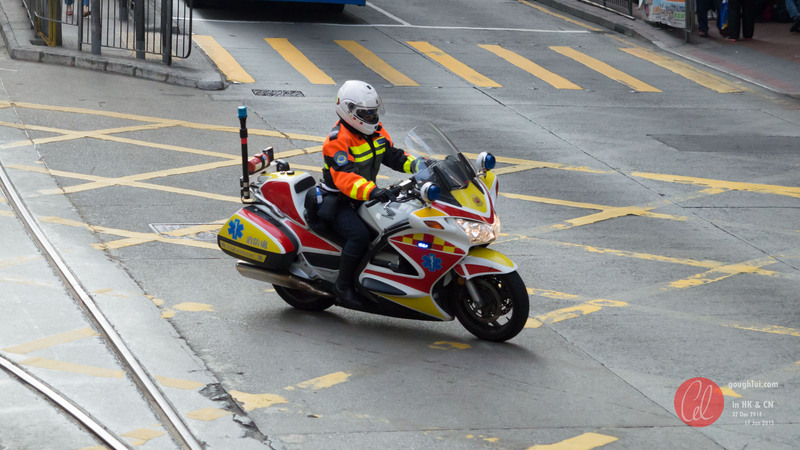 In doing so, we got to align our bearings – we saw something back from the Big Bus – the aerial flyover near HKU MTR station. 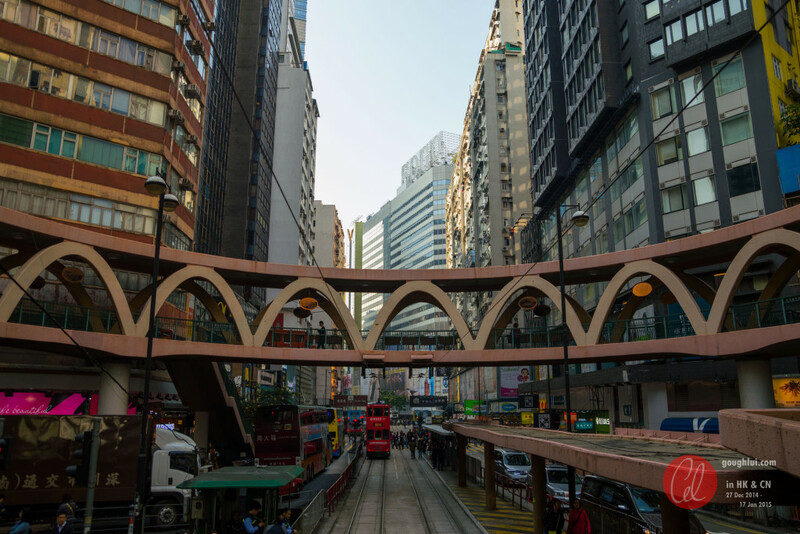 After our leg stretch, we were back on a tram towards North Point terminus, to visit the North Point markets. It was on this lengthy ride that I started snapping a lot of photos of people, and trams. 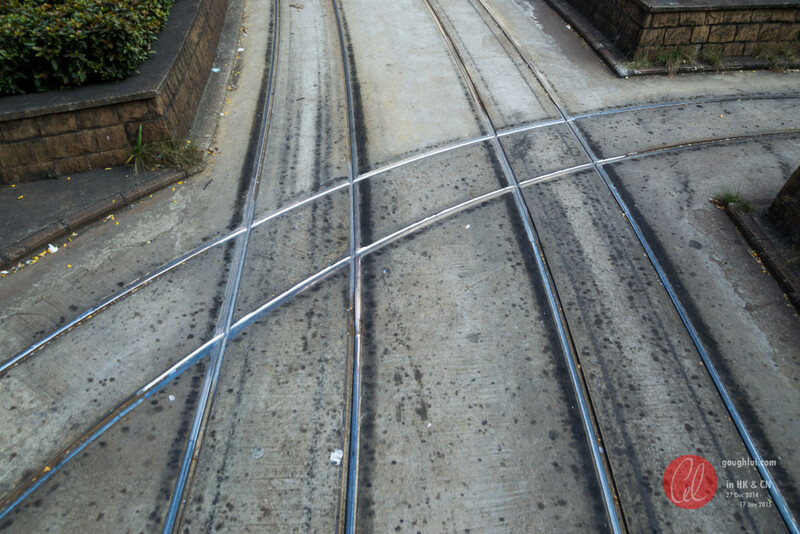 A lot of the time, when there is traffic congestion, you’re stuck following another tram in close proximity, which makes for difficult photography, but it does give you a good chance to admire some of the technicalities of the tram network. Here, we can see the trolley pole style current collector, with its “tiny” shoe riding in the wire, and the fixed supports for the wire. You can also see the “hook” at the rear, which is probably used to stow the trolley pole when taking units out of service. 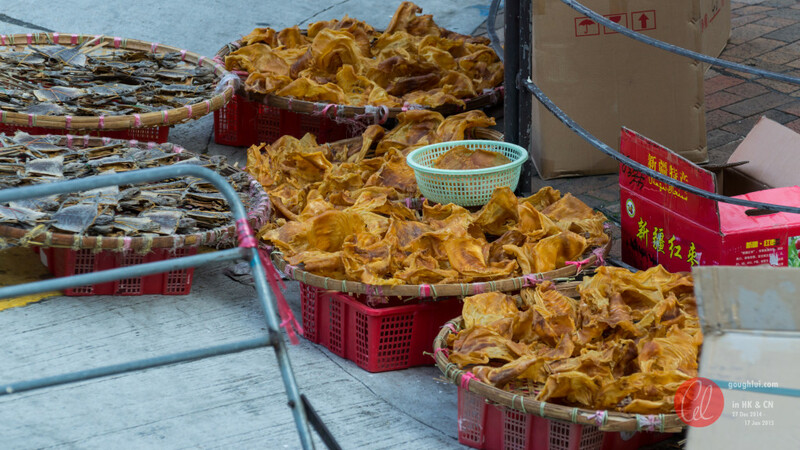 Around that area, dried seafood is commonly sold, and we can see them lining the streets. 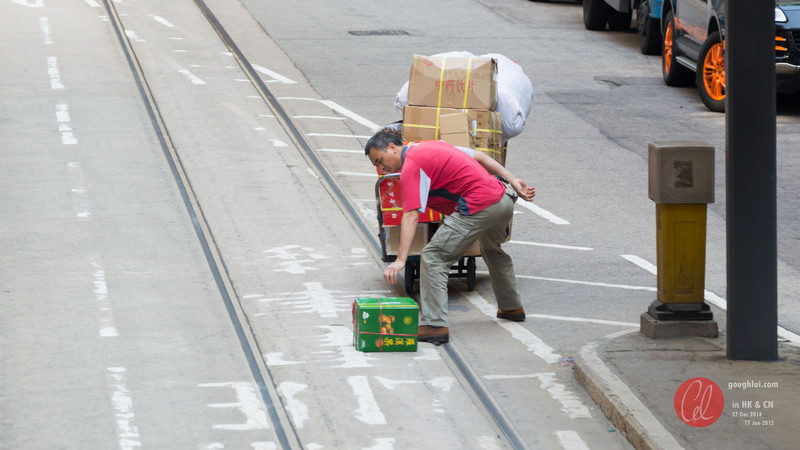 Unlike our overly-cautious society, the tram lines don’t seem to be treated as a danger in Hong Kong, with numerous people carting stock across and along them without much thought or even consideration as to getting run over. We managed to see many mishaps, which prompted the drive to use the bell. 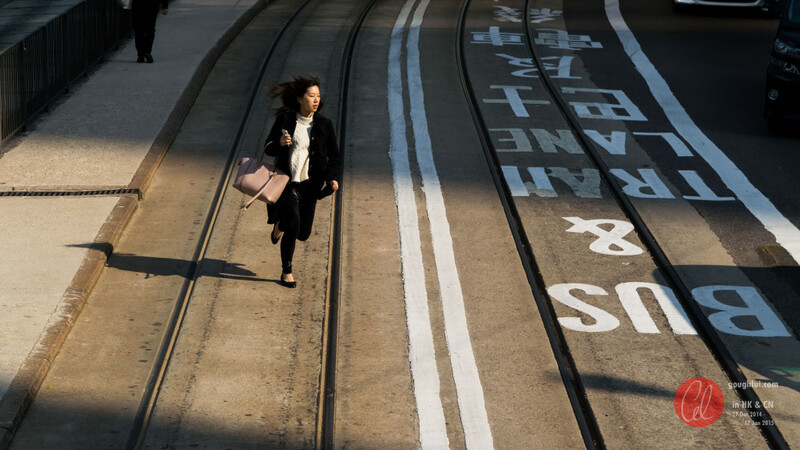 She might be running late … and running in front of our tram, but she’ll always arrive in style, and she won’t miss the tram – it’s probably stuck in traffic. 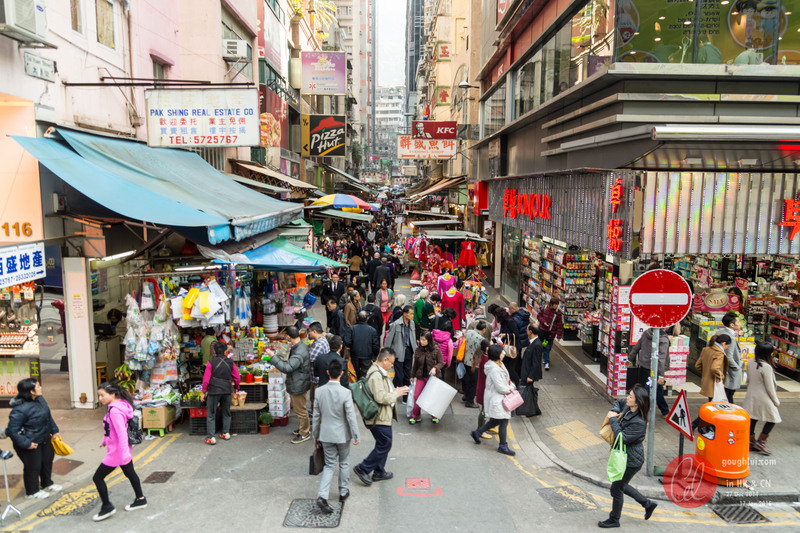 There’s no shortage of pedestrians on the streets, as many smaller side roads get turned into makeshift markets. 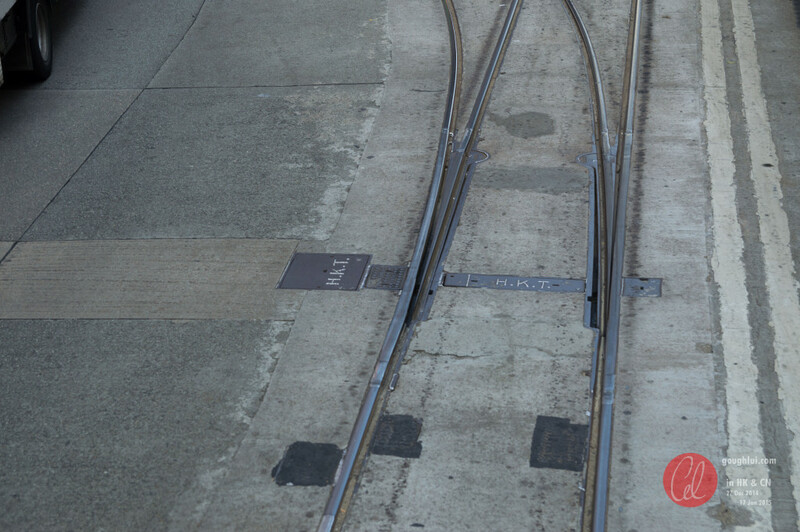 In some places, it seems like new stations have been added, so the tram line is “bent” to accommodate an island platform. … and we got to see some points operate in front of our eyes. 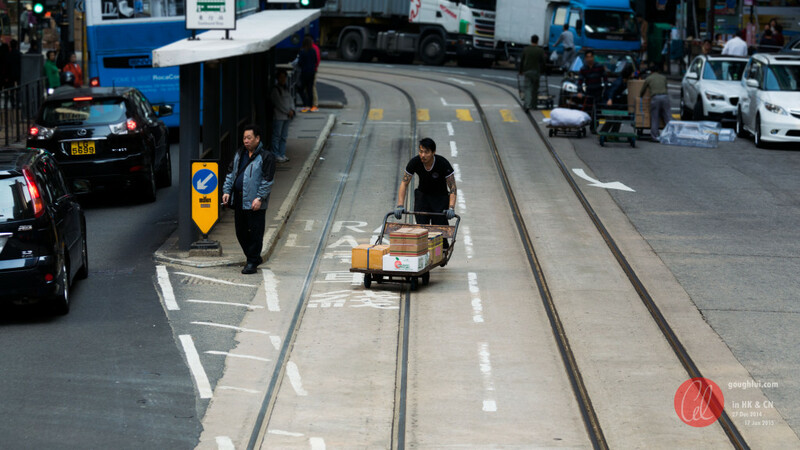 The equipment were clearly marked HKT for Hong Kong Tramways. The trams themselves were surprisingly short, and featured a single set of bogies right in the middle of the tram. When running across points or even joins in the rail, the tram felt like it had almost no suspension whatsoever, loudly banging and rattling along. It’s definitely got charm and character to it. 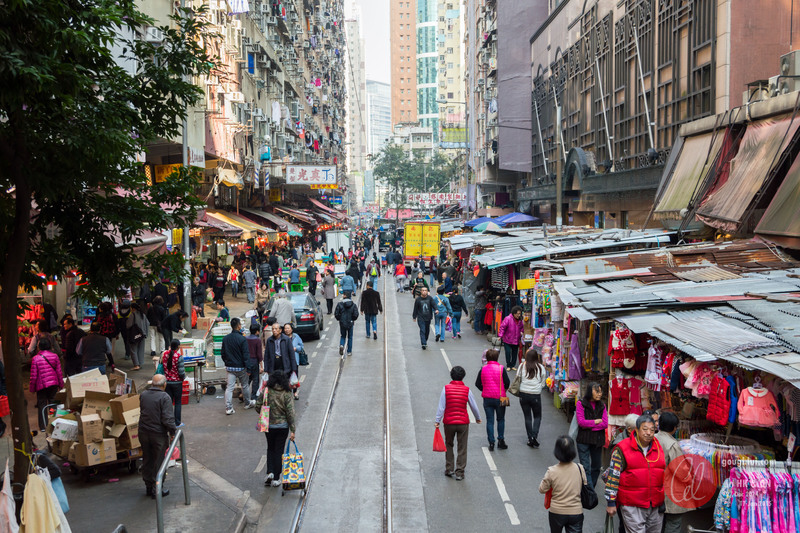 By the time we got to North Point, it’s even more drastic, as the tram line literally runs through the markets, and the people don’t pay that much attention to the tram that’s rattling slowly towards them from behind. It seems that all the terminus stations are configured in a “loop” so as to make running services more efficient. There is no need to use a pole to change the direction of the current collector, or change driver ends. Instead, the tram just joins the end of the line of trams next to leave the terminus. As we were joining this queue, we were told that we had to get off to hop onto the front tram in the line (i.e. the next to leave) – partly because this would allow them to collect their fare, which was only fair. The day had turned into mid-to-late afternoon, and the sun was starting to lower in the sky. 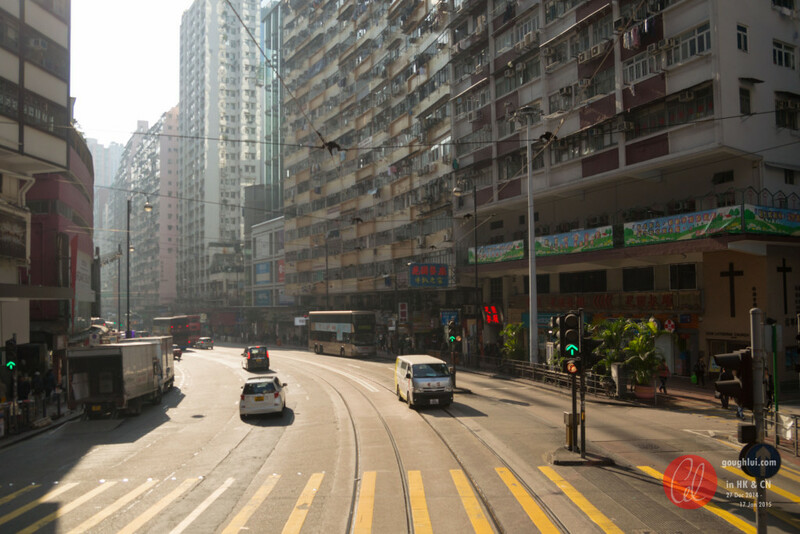 The haze was somewhat apparent, and the towering buildings cast intimidating shadows onto the roadway. Sometimes, you’re lucky enough to get a few glimpses of the sun, which quickly retreats back into hiding behind the next building. 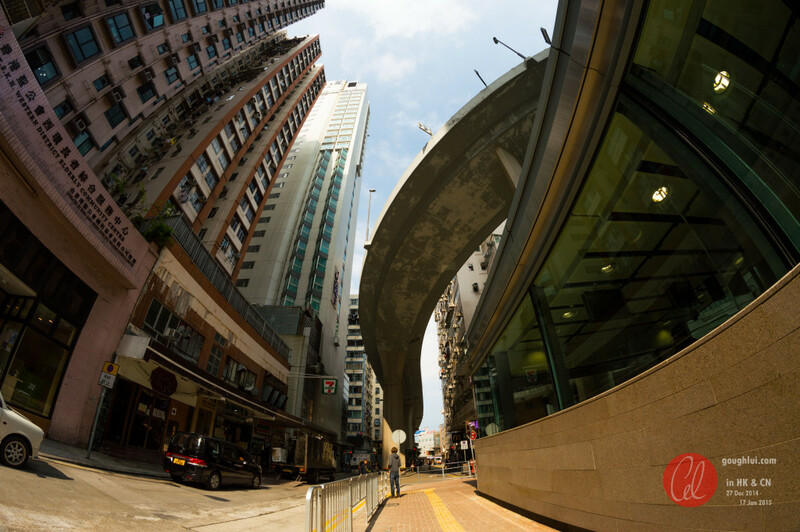 We were calling it a day, so slowly we were heading back towards Wan Chai. Unfortunately, being in the peak hour rush meant traffic jams – so this ride took a lot longer than I had expected. It did give me a chance to see more than I would have otherwise seen, such as the round walkway at Pennington Street. Right next to it was an official tramways driver shed, probably where they do change-overs and have their meal breaks. No fancy automated electronic driverless trams here. 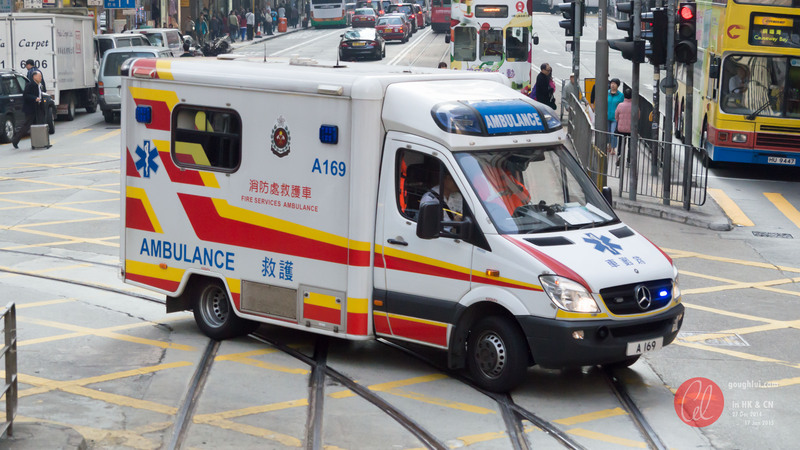 We also managed to catch a glimpse of some emergency services responding to something, but we weren’t quite sure what. It seems that tin can rustic charm isn’t reserved only for the Star Ferries, and can be found alive and well on land. The tram represents great value for money, for its aesthetic value as well as the transportation value, although it can be crowded and slow. Join us in the next part, where we catalog images of the trams that we have spotted on our tram day – there’s a few different types!